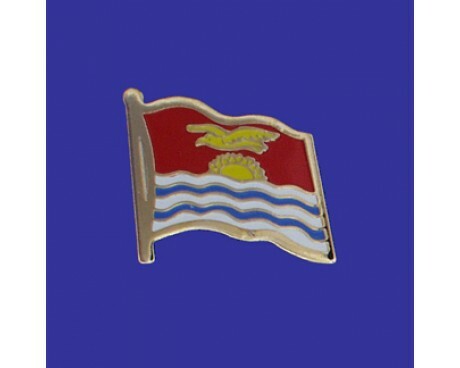 Kiribati Stick Flag - 4x6"
The flag of Kiribati is one of the most distinctive flags in the Pacific region. The Kiribati flag emphasizes the unique features of the island in order to create a strong symbol of its native culture and assets, but it also shows a strong link to the nation's colonial flag that honors the country's history. The current flag is very young, but that link to the colonial flag of Kiribati means that the modern flag is part of a significantly older tradition. The Kiribati flag features a golden frigate bird flying over a golden sun that is rising over the sea against a red background. The sea is represented by a set of six wavy stripes that alternate between white and dark blue. The three white stripes represent the three groups of islands that make up the country, while the blue stripes represent the ocean that surrounds those islands and governs a great deal of their economic activity. The sun that rises over those stripes has seventeen rays, which represent the seventeen islands that make up the country of Kiribati. The frigate bird that soars over the sun represents freedom and the traditional culture of the people who make their homes in Kiribati. 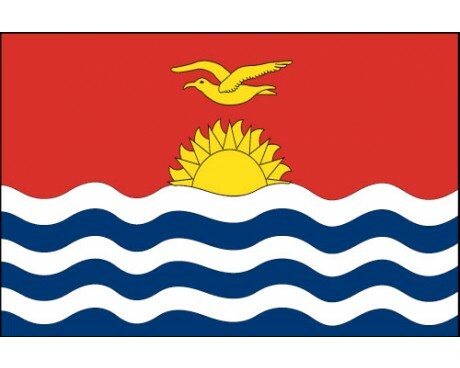 Kiribati did not have a flag until the British Empire chose to grant it a colonial flag. That flag followed the same pattern as the other colonial flags within the Empire. It was a British blue ensign that displayed the Union Jack in the flag's canton and the colonial seal in the fly. The seal used a design that is very similar to the current flag, but the proportions of the various elements were slightly different than those of the modern flag of Kiribati. The flag came into use in 1937, and remained in use until the nation gained its independence. 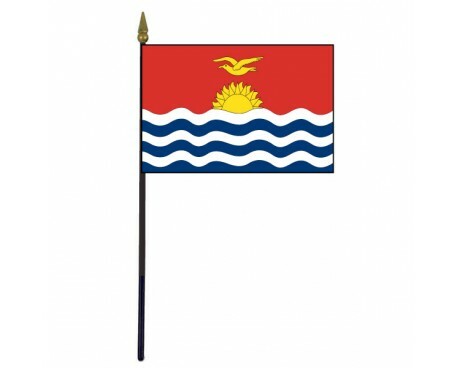 Kiribati chose its current flag through a competition that was held as part of the nation's transition to independence. 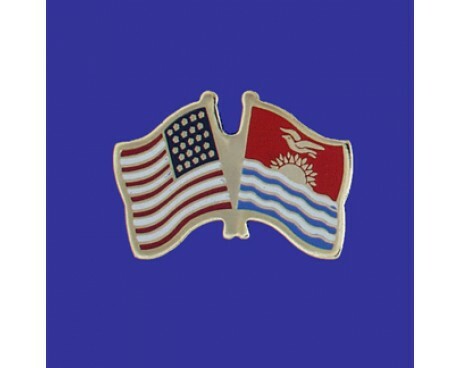 The winning design was so popular with the people of Kiribati that they would not allow the government to make any changes before it was adopted, and that popularity has made sure that it has not changed since it came into use in 1979.